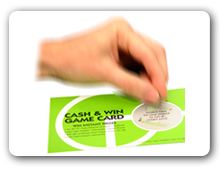 Scratch cards are in use across the world as a popular marketing activity as the cards provides the users some element of surprise. On scratching the cards, they know about the items or money they have won right away and can claim the small win then and there. At ID Tech Solutions, we are top scratch cards manufacturers and suppliers who can take care of your every need in designing and delivering the cards. Scratch cards dealers can depend on us for reliable supply of high quality scratch cards that are durable and easy to carry. We do bulk packaging as per the clients’ requirements.